My name is Murugesh, aged 49, from Bangalore. I was having very bad pain and was experiencing difficulties with spinal back pain for past 10 years. After consulting Dr. Yogesh K Pithwa, and by his advice, treatment and surgery, I am in good condition. I was unable to walk sleep, stand. But after his successful treatment and operation I have got a rebirth and I really thank God and I pray for him with almighty God every day.God bless him and his family. My mother had been suffering with acute back pain for six months, which was diagnosed with fever. There was infection in the L1 and L2. We checked with lots of doctors’ surgery and hospitals and finally landed at HOSMAT, where we met Dr. Yogesh K. Pithwa. 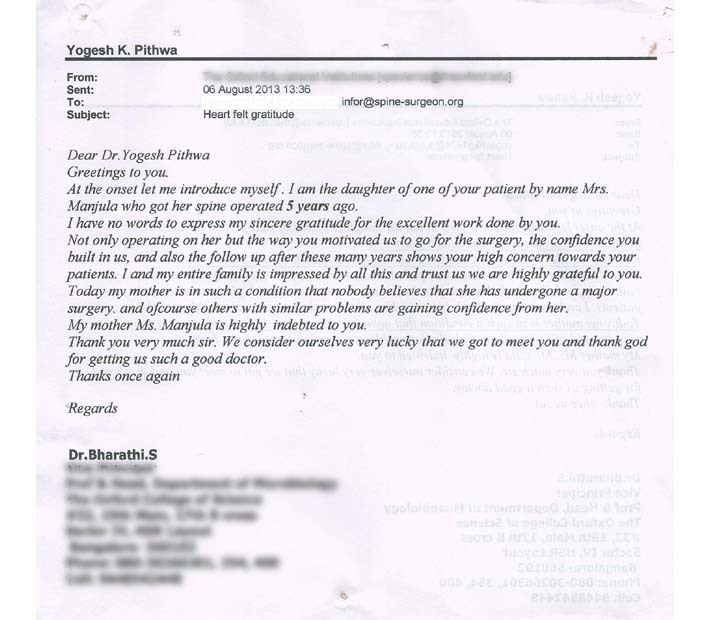 I would say that with the surgery for my mother was a rebirth for her.I would like to thank Dr. Yogesh K. Pithwa, without whom my mother would not have survived. He has truly been a God to us. Please consult him if you have any spine problems. Thank you doctor. I came to Indian from USA along with my wife to get surgery for my neck pain and for my wife’s back pain. I showed to several doctors in USA but I felt more comfortable with Dr. Yogesh K. Pithwa, a very decent doctor that I have seen in my life. 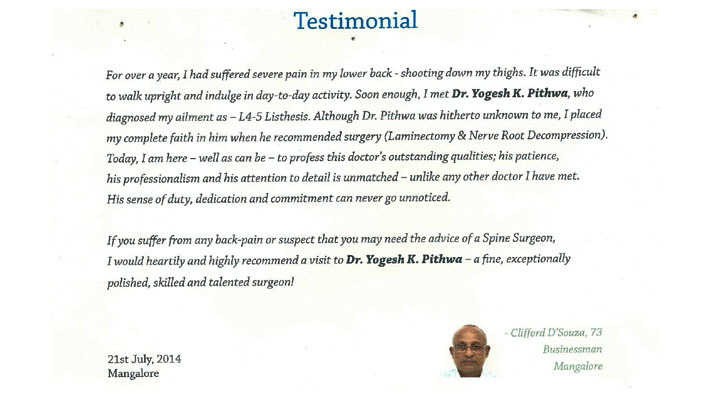 I was very scared about my surgery because it is a spine surgery but the way I was operated and my wife was operated by Dr, Yogesh K. Pithwa, I had no fear and felt that I am in safe hands. God bless Dr. Pithwa. Really we have found a rebirth to my wife who was suffering from bone TB. We found the doctor very humble in treating the patient and even explaining clearly to the attendants of the patients which is more appreciated Even the fee seems to be very nominal. Thank you for your service. Even though we have medical facilities at our working area, I find Dr. Yogesh K. Pithwa is the right person to cure various spine and bone problems. I had been suffering from back pain due to L4 and L5 spondylolysis since two and a half years. I consulted many doctors. However, my hope for recovery was going down day by day. I got my surgery done with Dr. Yogesh K. Pithwa. To be very frank, I was skeptical about my recovery. However, following the surgery, I am feeling really better. I was suffering from lumbar disc herniation. I was advised microdiscectomy. lt was difficult initially to reconcile to the fact that I required surgery but the possibility of a permanent cure to a 5-year old problem helped me adjust. The surgery itself was very smooth and the care was top notch. I could walk the next day following the surgery. For all the other patients with spine problems, I would say that if there is no alternative to surgery, then go right ahead! I had a degenerative lumbar disc problem. I underwent a spine surgery for the same with Dr. Pithwa. Before the surgery, a lot many people had advised me against undergoing a spine surgery. But spine surgery has helped me a lot. I feel that wearing a traction belt and lying in the bed for a long time is actually a painful and boring experience especially for a young person like me. Spine surgery has helped me recover faster and I feel that it is a much better and efficient way of getting cured from backache. I was diagnosed with scoliosis in 2002. It was because of my posture while sitting and walking that I got to know that something is wrong. I underwent the surgery with Dr. Pithwa. It was a painless experience. For all the other patients suffering with scoliosis, I would recommend that please do not delay the surgery. Even if your deformity is not causing you any harm now, it may do so later on. If you really need to undergo a surgery, please go for it! Do not be scared, you are just getting your problem rectified! !